Have you ever had the following experiences when learning a language on the the iPhone/iPod touch standard “Music” app? - Lost where you were listening. - Want to mark the tracks that you are not good at and listen to them later. - Want to play some tracks in loop without changing the Playlist. SoundPlayer for Listening will help you solve these problems. 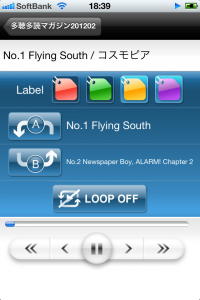 Import the audio source via iTunes and sync with iPhone/iPod touch, then launch the app. - Play and display a track on Playlist, Album or Artist synced to your iPhone/iPod touch. - Save information of the last played track and mark on it. 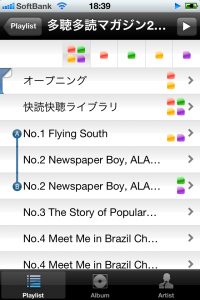 - Add a “red”, “yellow”, “green” or “purple” label for each track. - Narrow down the track list by label and play the refined list in loop. - Play in the background. - You can’t save the playback position when playing in the background. When your music is playing and the device is locked, the playback position will be saved as you unlock and return to the app.